The colorful reflective three-dimensional bar at the bottom of your Mac’s screen is your dock. (If you’re a PC user, think of the dock as a rough cross between the Windows taskbar and the Start menu. You can add icons to the dock, and even move them off. You can also resize the dock or lock the dock into place. Single-clicking a dock icon launches a program or other activity. When you mouse over a dock icon, the title of the appropriate application appears. When you see a blue orb glowing under a dock icon, you know that the program is running on your Mac. You can add your favorite items to the dock simply by dragging and dropping them there. Of course, the more icons you drop onto the dock, the more congested it is. To remove items, just drag them outside the dock. The icon disappears. Magnify the icons on your dock by choosing the Apple key→Dock→Turn Magnification On. Now as your cursor runs over the icons, the little pictures enlarge so that you can see them better. 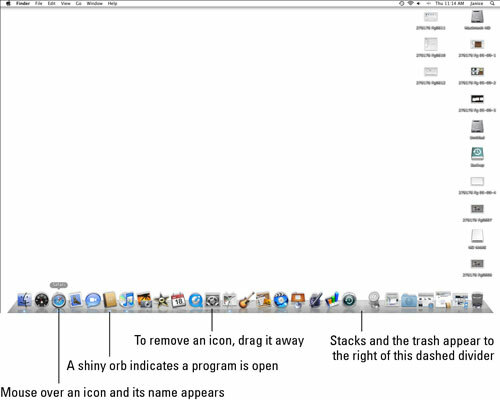 If you don’t want to your dock to appear at the bottom of your Mac screen, you can move the dock. Simply choose the Apple key→Dock and then, depending on your preference, either Position on Left or Position on Right. To make the dock disappear, choose the Apple key→Dock→Turn Hiding On. You’ll only see the dock when you move your cursor to the section of the screen where the dock would have otherwise been visible. When you glide the cursor away, the dock disappears again. (To make the dock appear permanently again, choose the Apple key→Dock Turn Hiding Off.